VISTA is a 4-m class wide field survey telescope for the southern hemisphere, equipped with a near infrared camera (1.65 degree diameter field of view) containing 67 million 0.34 arcsec pixels and available broad band filters at Z,Y,J,H,Ks and a narrow band filter at 1.18 micron. 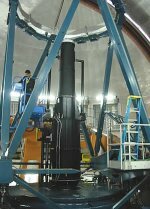 The VLT Survey Telescope (VST) is the largest telescope in the world designed for surveying the sky in visible light.This 2.6m telescope is equipped with an enormous 268-megapixel camera called OmegaCAM. 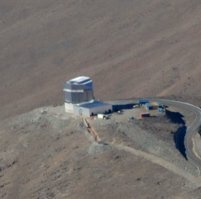 With a total field view of 1°x 1°, twice as broad as the full Moon, the VST was conceived to support the VLT with wide-angle imaging by detecting and pre-characterising sources, which the VLT Unit Telescopes can then observe further. The VST will be dedicated to survey programmes, three of which have been planned already: KIDS, VST ATLAS and VPHAS+. The Wide Field Camera (WFCAM) has the largest field of view of any astronomical infrared camera in the world. In a single exposure it can image an area of the sky equal to that of the full moon. It is a novel and unusual 'forward-cassegrain' optical design shown here mounted just above the centre of the 3.8-metre-aperture United Kingdom Infra-Red Telescope (UKIRT) mirror. Although the camera's four mercury cadmium CCD detector arrays occupy a space not much larger than a compact disc case, the entire WFCAM camera is huge. It is an imposing black cylinder, 5.4 metres (18 feet) long and weighing 1500 kilograms (1.7 tons), which points towards the sky from the telescope's primary mirror. 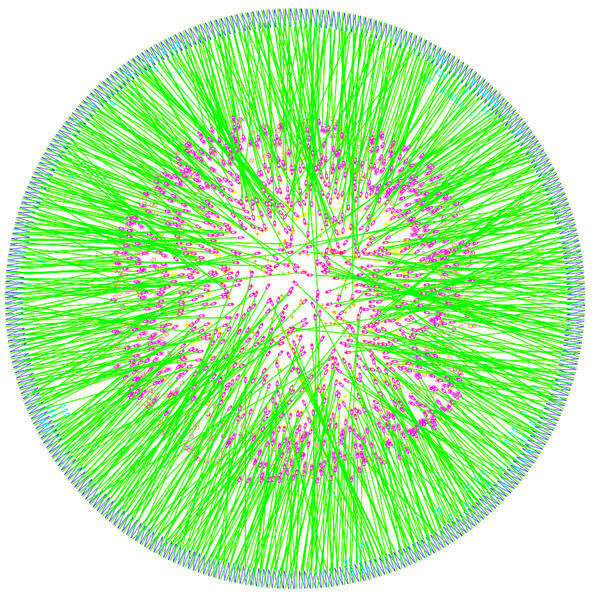 Gaia-ESO is a public spectroscopic survey, targeting ≥ 105 stars, systematically covering all major components of the MilkyWay, from halo to star forming regions, providing the first homogeneous overview of the distributions of kinematics and elemental abundances. 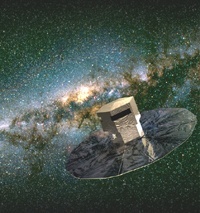 Gaia-ESO Survey is an ESO project (project 188.B-3002). At CASU we process all data from the Giraffe spectrograph and perform the internal releases of data to the collaboration. 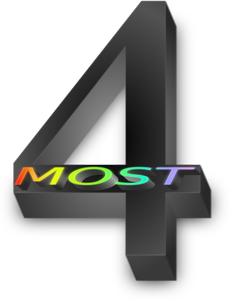 4MOST will be a fibre-fed spectroscopic survey facility on the VISTA telescope with a large enough field-of-view to survey a large frac­tion of the southern sky in a few years. The facility will be able to simultaneously obtain spectra of ~2400 objects distributed over an hexagonal field-of-view of 4 square degrees. IPHAS is a survey of the Northern Galactic Plane being carried out, in Hα, r and i filters, with the Wide Field Camera (WFC) on the 2.5-metre Isaac Newton Telescope (INT). This will be followed in the next few years by a survey of the southern Galactic Plane on the VLT Survey Telescope (VST) using OmegaCam, once it is commissioned. Together, these surveys provide a springboard to a quantitative revolution in our understanding of the extreme phases of stellar evolution. The previous generation of Hα surveys of the Galaxy, conducted over 30 years ago, begin to be incomplete even at mV=12 - the new generation extends this limit down to red magnitudes fainter than 20. Gaia is an ambitious mission to chart a three-dimensional map of our Galaxy, the Milky Way, in the process revealing the composition, formation and evolution of the Galaxy. Gaia will provide unprecedented positional and radial velocity measurements with the accuracies needed to produce a stereoscopic and kinematic census of about one billion stars in our Galaxy and throughout the Local Group. This amounts to about 1 per cent of the Galactic stellar population. The INT Wide Field Survey used the Wide Field Camera on the 2.5m Isaac Newton Telescope (INT) to survey 200 square degrees of sky in five bands U, g, r, i, Z to one magnitude deeper than SDSS. The processing and calibration was the responsability of the WFS project. Data cutouts, image catalogues, science images and much more are available through this access point. A registration script is built into the browser for those who wish to access the facilities offered therein. 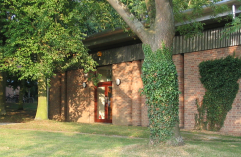 The CASU Astronomy Data Centre houses a good selection of data from the UK's ground based telescopes (JKT, INT, WHT, UKIRT) as well as a number of catalogues (Tycho, Hipparcos, APM). The ADC also operates a mirror of the VizieR service developed by the Centre de Données, Strasbourg.